Going '...where others have not gone previously', Starfighter Decals moves on to the 'bad guys'. 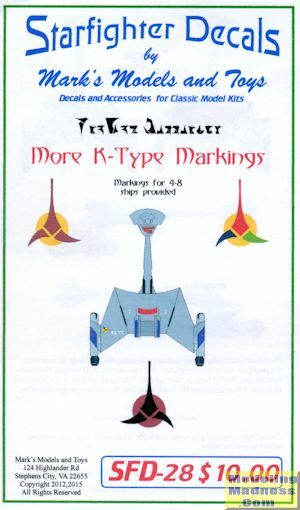 In this case a sheet of markings for the infamous Klingon K type Star Cruiser. The sheet has a ton of markings that should provide fodder for from 4-8 different ships. As with other sheets in this series, there are full color placement suggestions provided. 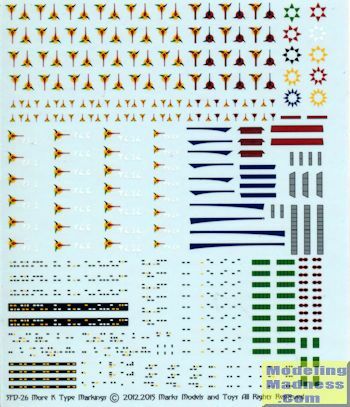 These decals are standard water slide markings and designed for war gamers as much as dedicated modelers. I am going to guess these are for Starfleet Battles, a rather popular game for those into this sort of thing. The decals themselves are crisply printed and will provide hours of application enjoyment.